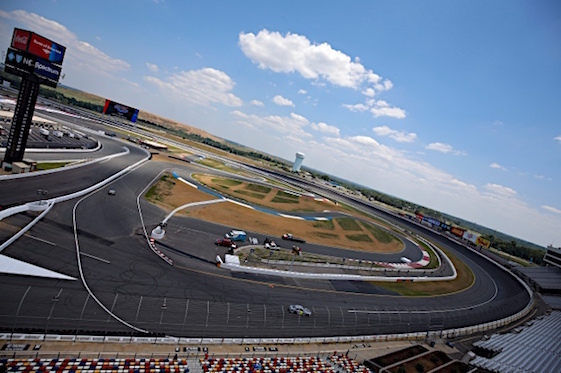 BRISTOL, Tenn. – Speedway Motorsports Inc. President and CEO Marcus Smith said Saturday that with the creation of Charlotte Motor Speedway’s ROVAL it was possible that IMSA and/or the Verizon IndyCar Series could return to the iconic facility. IMSA visited the facility in the early 1980s, utilizing the speedway’s old road course. Indy Cars raced on the 1.5-mile oval 1997-98. The 2.28-mile ROVAL consists of 17 turns and two chicanes, one on the oval’s frontstretch and another on the backstretch. Smith said the most challenging part of preparing the course was the fact they were in unchartered waters. In addition to developing the new course, speedway officials constructed a pedestrian bridge for those camping in the course’s infield and replaced the grass on the frontstretch apron with 929 tons of sand and 111,500 square feet of artificial field turf. It took six to eight weeks to replace the natural grass. Smith said track officials worked closely with Fields Inc. to find the special synthetic turf. Smith doesn’t anticipate any issues with the turf if it rains during a race weekend. Described by speedway officials as a “new fan entertainment area”, it will be used following the Sept. 29 Drive for the Cure 200 NASCAR Xfinity Series race for a Sammy Hagar concert. The 90-minunte concert by the Rock and Roll Hall of Fame inductee begins at 9 p.m. and is free to Bank of America employees and ticket holders to the Cup and/or Xfinity series races. Prior to the concert, “NASCAR Trackside Live” will host a show at 7:45 p.m. at the location. Track officials also have created a camping area in the middle of the road course, which along with the 600 Terrace RV spots that overlook turns one and two on the oval and the pit suites, are sold out. The pedestrian bridge goes over the road course’s turn three and allows access to the eye or infield of the ROVAL from the area beside the Bojangles concession stand. The 80-foot long, 9-foot wide bridge span weighs 22,000 pounds. The open-air walkway has 2 elevators for those unable to use the steps. The concourse under the Grand National Tower grandstand is being renovated as well. During a press conference Saturday at Bristol Motor Speedway, Smith and Charlotte Executive Vice President Greg Walter unveiled the winner’s trophy for the Bank of America ROVAL 400. The three-foot tall, 60-pound trophy has a floating outline of the ROVAL course and is a replica of the Bank of America corporate center in Charlotte, N.C.